#1 Remember about the Cactus lamp I was telling you in my previous weekly edit? Well, there it is! I am obsessed with it! #2 Last week I forgot to mention that I made scones for the third time! This time I made the dough right but unfortunate made the pieces too thin. I pretty sure if I made the slices thicker they would've been perfect! #3 I finished watching Girl Boss this week. It's inspired by the Girl Boss book but it's a comedy of events that happened to the founder of Nasty Gal. I thought I wouldn't like this series but I actually I actually loved it! If you are looking for something to watch this weekend I would recommend Girl Boss. #4 The Smore's frappuccino from Starbucks is back! I can't wait to treat myself and get one over the weekend. By the way for those who don't know all frappuccinos are 1/2 price until next week! #5 When I heard that Frank Body released a shimmery body scrub I was all over that! The shimmer scrub doesn't contain any actual glitter or shimmer but its key ingredient is actually glow dust. I will definitely write a review on this as soon as I try it. #6 As you guys know I follow the Blogilates monthly workout calendars. This month though we are doing something different. Instead of 4-5 videos per day, we are doing one HIIT video a day four times. I like the change because I hate repetition. #7 I wanted to ask you guys a question. When do you read my posts? I've always been curious because I try to post my posts up at 3:30 PM EST because that's the most convenient time for me but I've thought about changing it to a different time but I'm not sure when morning? afternoon? evening? The cactus lamp is so cute! 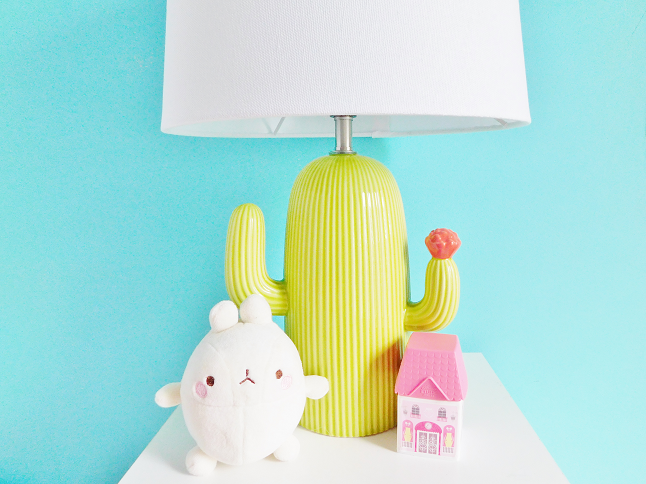 That cactus lamp is the cutest thing ever! I love novelty home decor items. Where is it from? Also, I'm not sure how other people read the blogs they follow, but to me it doesn't matter what time people post, as I make sure to read every single post regardless. Whenever I have the time, I will refresh my reading list and catch up on any new posts. I never want to miss a thing!